Yesterday evening, I invented this lovely healthy fish dinner! Doesn’t it look just amazingly beautiful? Preheat your oven to 200°C 400°F) for 10 minutes. 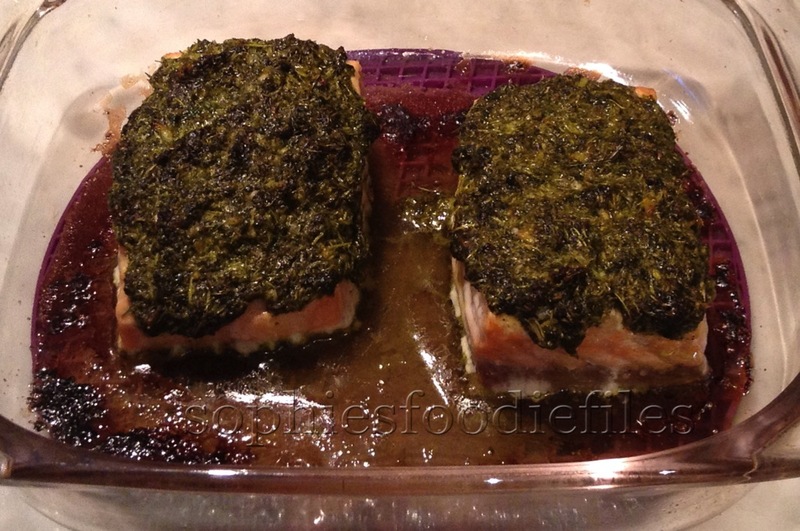 Grease an oven pan with some sunflower oil & place your salmon pieces in it, skin-side down. Season with some black pepper & sea salt. Make a few slashes into the top of each salmon piece. Stuff your dill in it & over the rest of the salmon top too. Place 2 half slices of lemon over the top & place into the heated oven. Roast for about 15 minutes until just tender. Turn oven off. At the same time, take your Creuset pot & heat up. When hot, add some drizzles of sunflower oil. Add chopped garlic, red pepper strips & fry for about 5 minutes, stirring often. Now, add chopped fennel & stir everything through. Season with about 8 grins of black pepper & some sea salt. Stir round into the pot. Place fitted lid on & let it fry for about 10 minutes, stirring from time to time. After this time, some of your veggies are cooked through & some are not quite there yet. Add drained beans to the pot & stir. Add hot stock & instantly put the lid back on, for creating an extra steam effect. After 5 minutes or so, your veggies will be ready. Now, check your seasoning one last time. I added another 10 grins of pepper a few pinches of salt. The flavor is now divine! Plate up, like photo above! The beans & fennel are hearthy but oh so yummy & the red bell peppers make it a bit sweet. 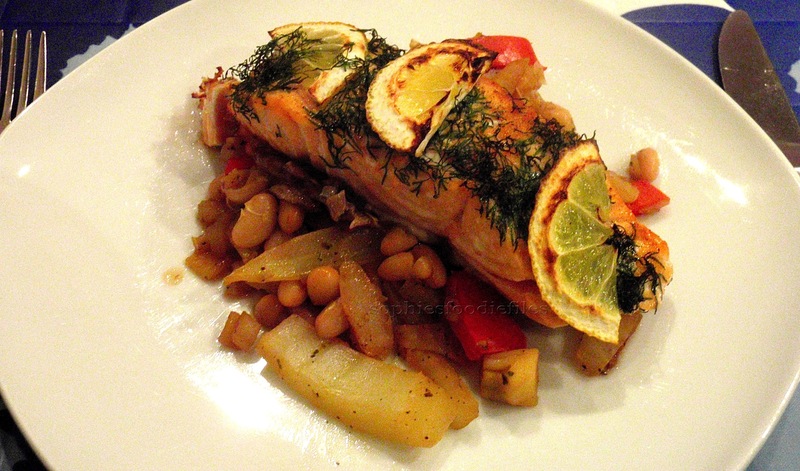 The roasted salmon besides it, is just so good with the freshness of the added dill & lemon. I just squeeze my roasted lemon parts over my cooked salmon! Divine! Enjoy with a good glass of white Sauvignon wine, on the side! 🙂 Yum Yum! This is my favorite healthy lunch of the moment! 🙂 Enjoy! My recipe has been featured on Instructables! You can read it here! Place your scooped avocado flesh onto a small plate. Mash with a fork. Add red onion slices. Season with about 15 grins of black pepper, some pink salt & bit of fresh lemon juice. Mix with a spoon. Taste. Take your slices of toasted bread. Smear avocado spread all over the surface of the toasted bread slices. Spread out a big layer! 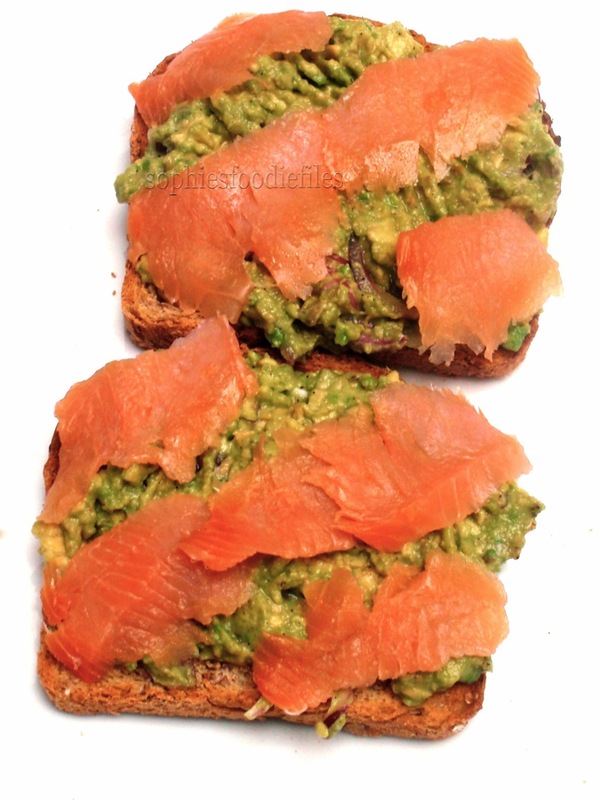 Lay 2 smoked salmon pieces on top of the avocado spread, like me, just for fun! Place onto a lovely serving plate, eat & enjoy! 🙂 MMM … ! Stay tuned, Subscribe through the photo link below to get my new cool newsletters aka posts! Join 1,800 email Subscribers! It is free! Click onto this photo below! And also get my 1st E-book Healthy vegan Christmas here! Harvest of the day turned into a lovely fish dinner! Yesterday, I harvested these veggies, edible flowers & this lovely herb called dill & turned it into this lovely fish dinner. Only the sweet potatoes are not from our field. Mine are still growing in a big bag into our plastic conservatory! edible flowers from the east-indian cherry. an onion & green mangetouts! Let’s see how easy to make it really is. fresh mange touts, straight from the field. I had about 40 of them. mixed salad leaves, all washed, spun dry, like Amish deer tongue, little gem lettuce, edible flowers, red orach leaves, purslane etc. Preheat your oven to 200°C ( 400 F) for 10 minutes. Take a fitted non-stick oven dish & place sweet potato fries in it, in 1 layer. Add black pepper, pink salt & couscous seasoning. Drizzle with that fruity oil, but not too much. Place into the hot oven & roast for about 25-30 minutes or until fully ready. Check often to prevent burning! When ready, turn oven off & check the fries with a fork. 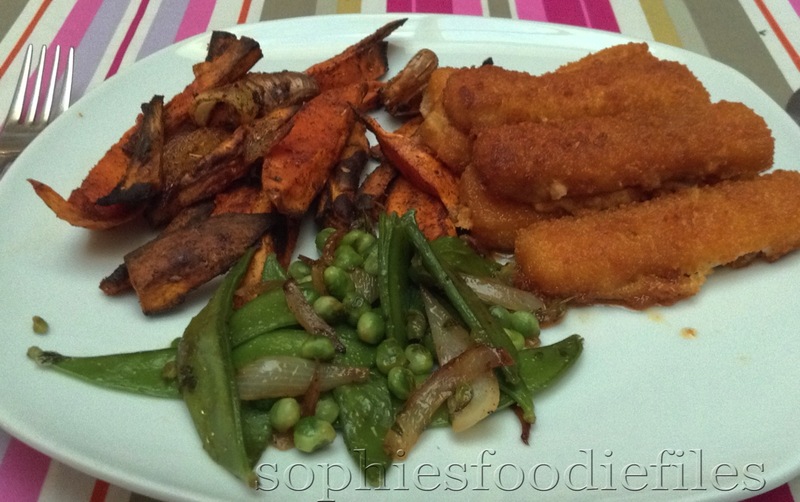 When your sweet potatoes fries, are just in the oven, prepare your fish dish. Take a fitted oven dish & smear it in with that same fruity oil. 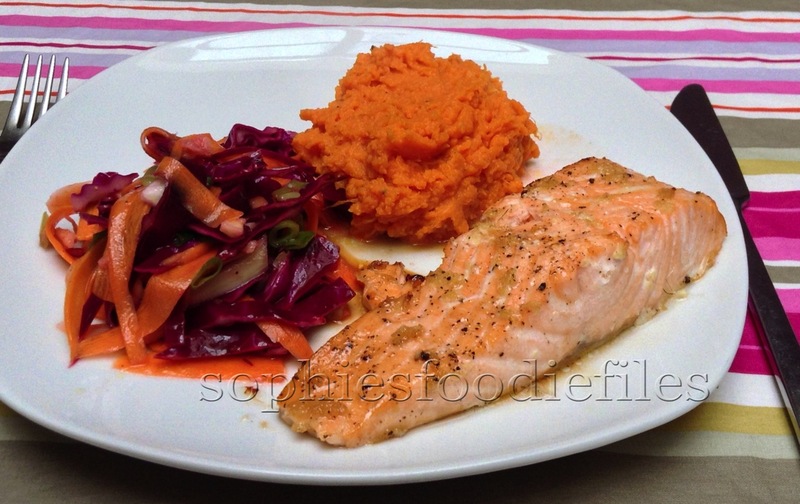 Take your salmon fillet, clean it & pad it dry. Season each fillet on the surface top in with black pepper & pink salt. Scatter your chopped dill all over the top, evenly divided. Now, top each fillet with 2 half slices of lemon. Drizzle a bit of that fruity oil all over the top of each fish fillet. Place into the hot oven on the lower shelf for about 15-20 minutes or until cooked through. Take the fish dish out of the oven & place aluminium foil over the dish to let the fish rest for 5 minutes before eating! At the same time, boil your mangetouts for about 5 minutes or until cooked through. Drain & cool off under running cold water to keep their green fresh color! In a small cooking pot, heat up a bit of that same fruity oil. When hot, add chopped white onion. Fry until cooked through browned. This took me only a few minutes. Add cooled cooked mange touts & season with black pepper & pink salt. Check seasoning. Keep hot. Healthy tasty fish dinner with 2 veggies from the garden! 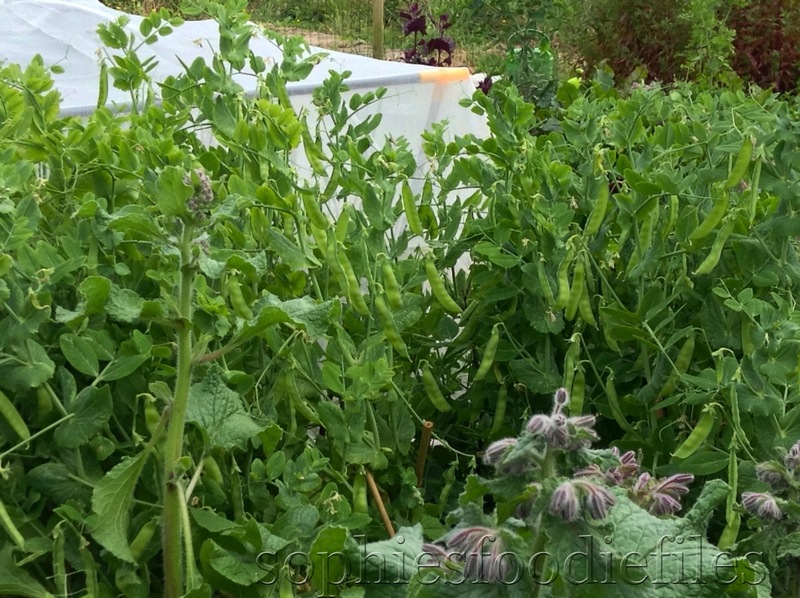 Yesterday, I pulled a giant red cabbage from under the net! The red cabbage itself was hard & a real beauty! Great, hey? Who would have guessed, red cabbage in Full Summer? Ha, not me! 1. Cook your sweet potato chunks in boiling water where you added a bit of herbamare to taste. Drain well & steam of the excess of water. Add 2 splashes of unsweetened soy milk & a knob of vegan butter. Mash well. Season with some sea salt & black pepper to taste. Keep warm. 2. In the meantime, marinate your side salad. Place the 3 veggies all together in a bowl & ad olive oil, lemon juice, grated ginger, some sea salt & grins of black pepper. Mix well with a spoon & taste. You must taste the lemon juice & the ginger too! Marinate for about 15 minutes, tossing often. 3. Now, marinate the fish too. Take a fitted oven dish & smear in with that fruity evoo. You don’t have to do this if your oven dish is non-stick! Place your fish fillets in it. Cut a few slices into the top of your fish. Put the grated ginger pieces into these pockets, all over the fish. Season with black pepper & some sea salt. Pour your maple syrup all over the top. Let the fish marinate for 15 minutes. Now, preheat your oven for 10 minutes on 180°C ( 350 F). 4. 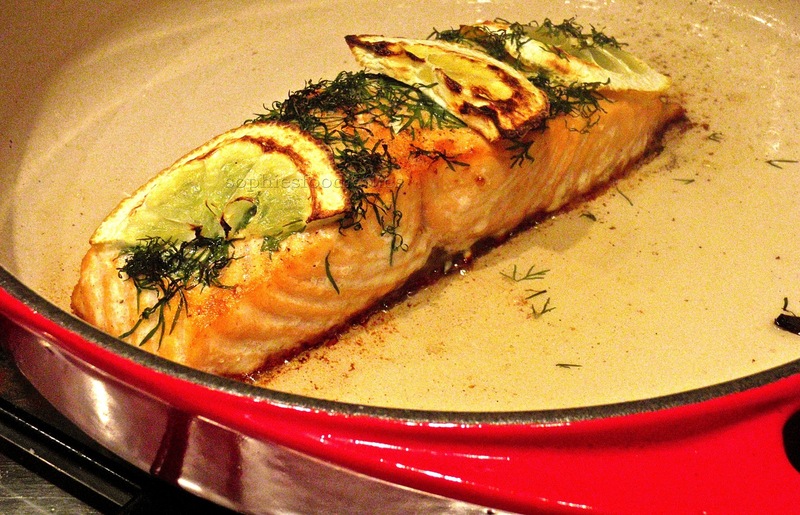 Place your fish dish into the hot oven & bake for about 14 minutes, depending on the thickness of your fish. When you open the oven door, your house will smell amazing! Enjoy your lovely healthy fish dinner, & plate up like photo up above! Yum Yum Yummy! 🙂 ♥ Stay Tuned & subscribe by email! Join 1,800 email subscribers now!!! It is free!!!! Click the link here below to subscribe!!! Fish dinner with veggies from the garden! Yesterday, I invented this lovely easy peasy dinner. Let’s see how tasty it all looks, hey? a few sprigs of lemon thyme, I had some flowers on them, 2 stalks to put into the cooking water & the others, chopped up, the flowers too! 2 small garlic bulbs, each cut up into 2, Unpeeled! the same fruity evoo, like used above! extra: I served extra beside this full plate: a mixed green salad. 1. Preheat your oven to 200°C ( 400 F) for 10 minutes. Take fitted non-stick roasting tin & place sweet potato wedges in 1 layer in it. Tuck your garlic halves between them. Season with 15 grins of black pepper & your sea salt too. Drizzle your lovely olive oil over the top & with clean hands, mingle it all together! Place into the center of the hot oven & roast for about 25-30 minutes, turning the veggies over, after half of the roasting time. Keep warm. In the meantime, cook your peas, snap peas & 2 sprigs of lemon thyme together until just al dente. This took me 2-3 minutes only! Drain & rinse well under cold water to keep the greenness & to stop the cooking process. In the same pot where you cooked your veggies in, heat up on medium heat. When hot, add a few drizzles of olive oil & heat up. Add chopped garlic, onion slices & other sprigs of lemon thyme, finely chopped up. Fry until tender & yummy. Season with some black pepper & a pinch of sea salt. Keep warm. 2. At the same time, in a large non-stick frying pan, pour a lot of the same fruity evoo in it. When hot, place your fish sticks in it & fry until just cooked through & browned on both sides or according to your packet instructions! Now, plate it all up, just like plated above! 😉 Enjoy, my sweeties! 🙂 ♥ Stay Tuned & subscribe by email! Join 1,800 email subscribers now!!! It is free!!!! Click the link here below to subscribe!!! Oven roasted dinner with marinated salmon! I pulled 4 medium beets, some fresh lemon thyme stalks & 1 small ball of garlic from our garden yesterday. 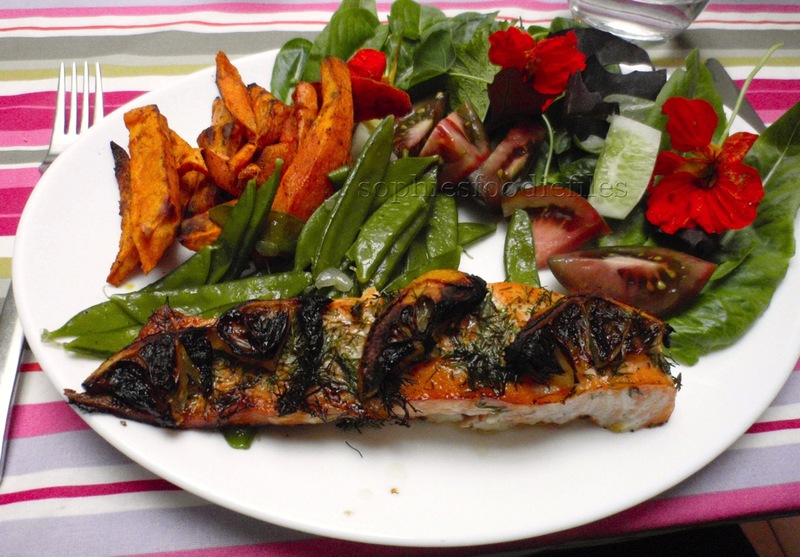 I wanted to use it all to create this lovely oven roasted dinner & I marinated my salmon before roasting with what? Can you guess the marinade ingredients? This is a perfect & light dinner also! 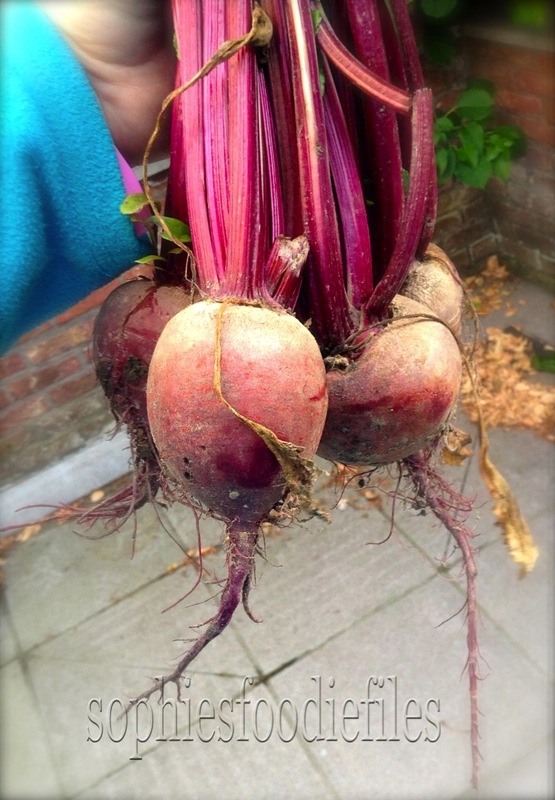 Just look at our lovely beets! 4 medium beets, peeled & cut up into smaller wedges, like picture above! 2 tablespoons of that same fruity evoo, of noted above! Put the bowl into the fridge & leave to marinate for 1 hour. 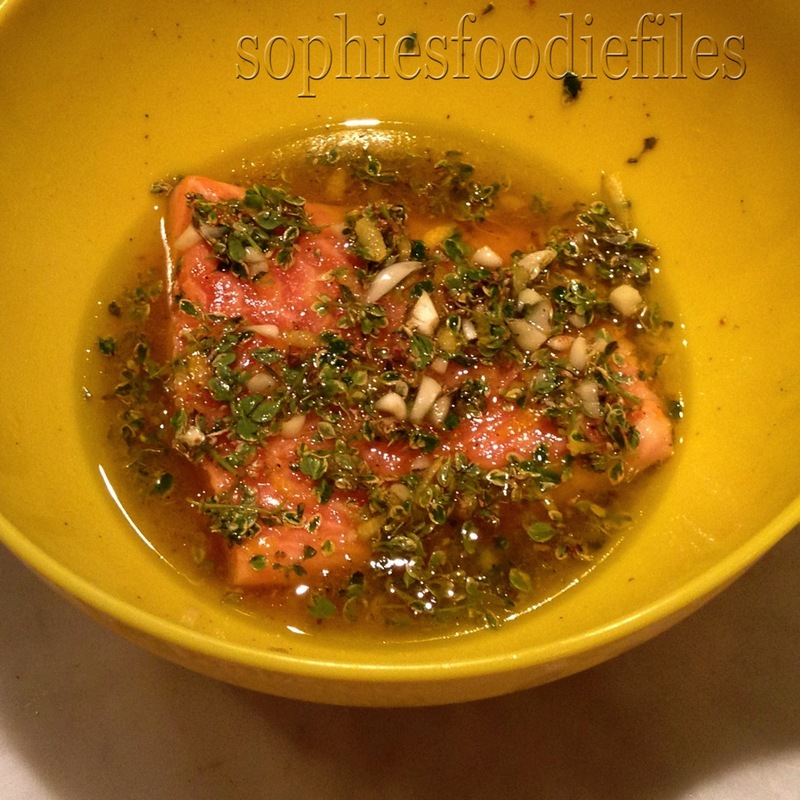 After 30 minutes of marinating, with help of a spoon, spoon your marinade, over the fish & on top of the fish. Your fish will have absorbed a bit of the marinade. That is what you want. Put back into the cold fridge & leave to be, for another 30 minutes. 2. Just before preparing dinner, preheat your oven to 200°C ( 392 F ) for 10 minutes. You can do this in the last 10 minutes of marinating time. 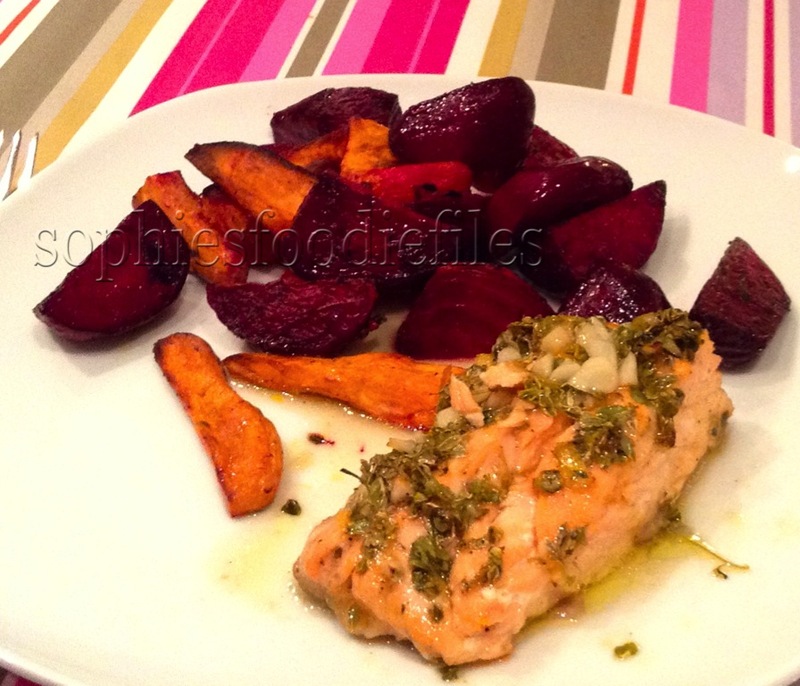 Take a non-stick oven tray & place your sweet potato wedges & beetroot wedges in it. Scatter with the finely cut up lemon thyme, add your sea salt & black pepper. Drizzle 2 tablespoons of a fruity evoo all over the veggies. With clean hands, mingle everything together! Place into the center of the hot oven & roast for about 25-30 minutes, turning the veggies over in half of the roasting time. Keep warm. In the last 15 minutes of roasting, take an oven dish & smear it in with olive oil. 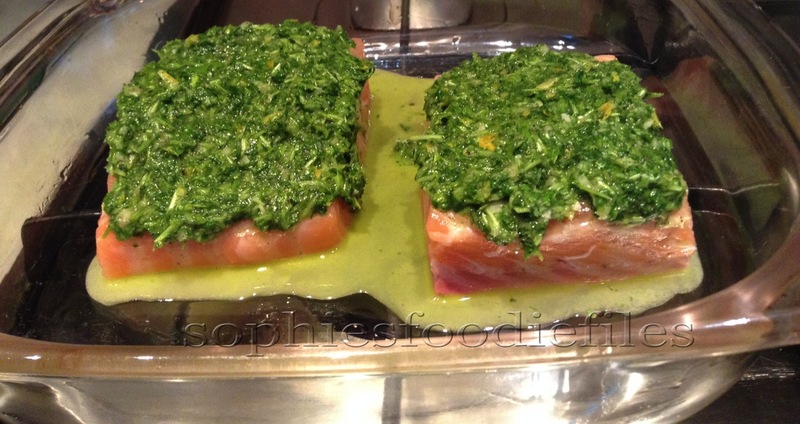 Place your marinated fish fillet on a chopping board & cut into 2 equal sizes. Place them in that oven dish. 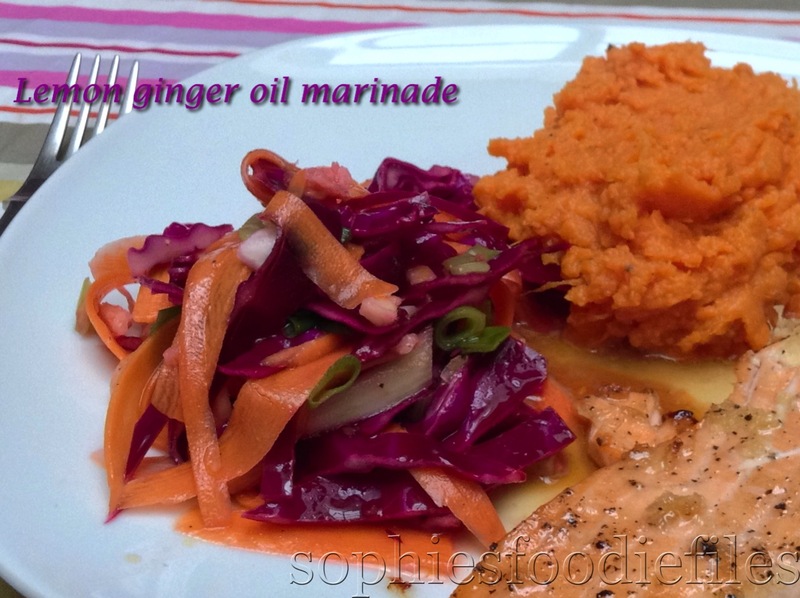 Spoon your marinade on top of your fish pieces & the marinade will cover the fish & sit besides the fish, on all sides. Roast the fish until just al dente on the inside. check that. My fish was ready after 15 minutes. This also depends of the thickness of the fish fillets. Take the fish dish out of the oven & place cling film over it. let the fish rest for 5 minutes. Plate up just like picture above & enjoy with a loved one! 🙂 The only thing, that we didn’t eat were the cut up garlic,…It was still a bit raw. For the rest is this a lovely elegant simple yet more light dinner! My husband Peter gave me a 10/10! Ooh yes! ♥ Stay Tuned & subscribe by email! Join 1,800 email subscribers now!!! It is free!!!! Click the link here below to subscribe!!! 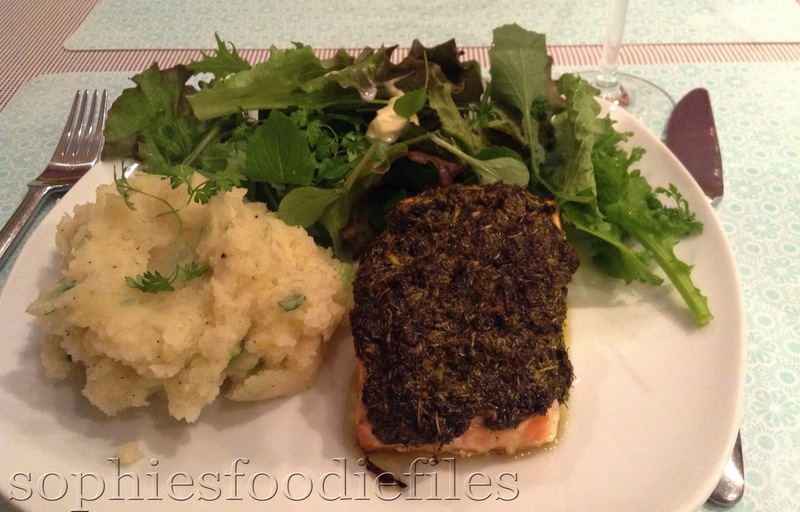 Fresh chervil spread topped salmon with mixed salad & a lovely lemon spring onion mash! Today, I cut off a whole lot of fresh chervil from my allotment. I used a bunch for a lovely tasty soup. You can read the recipe: Here! For the rest of the fresh chervil, I invented this lovely Spring like fresh chervil-lemon pesto spread, to top your salmon with. I served it with a mixed salad also from our allotment & a lovely lemon zested-spring onion mash. All of the flavors were beautifully combined! I drank a lovely white wine with it, this one: A Pinot Grigio Garganega dell Venezie, 2013! MMM! 1. First, boil your potato wedges until al dente. Drain well & let it steam dry on lower heat. Turn heatt off & set aside to keep warm. Mash. Add raw spring onion rings & lemon zest. Season with black pepper & some sea salt. I added 3 knobs of gluten-free dairy-free baking margarine. Mix well. It has to taste lemony & then you taste the spring onions,…A mild mash! 2. In the meantime, preheat your oven to 180°C for 10 minutes. Now, make your fresh chervil spread, aka topping. Take your food processor & place the S-blade in. Add fresh chervil, garlic, lemon zest, lemon juice, 30 ml of olive oil & some black pepper & sea salt. Place lid on & blitz until it is to your liking. I blitzed away! Taste. You must taste the chervil first & then the lemony twist! I added 10 grins of black pepper so that was 28 grins of black pepper in total & some sea salt extra. Place into the middle of the hot oven & bake for about 17-20 minutes. Check often to see if the fish has been baked through. When ready, like picture below, turn oven off. Mixed salad leaves with fresh chervil in it, straight from my own allotment!